Whatever your take on Brexit. Whether you approve of the recent UK election results. 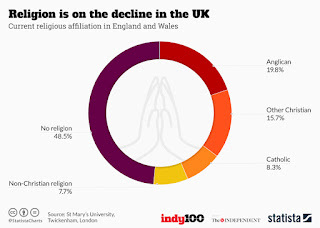 One recent statistic shows younger people in Britain voting with their feet as far as religion is concerned. The latest British Social Attitudes Survey's extended data on religion or belief is showing that 71% of 18-24 year olds in Britain are non-religious. The overall figures tell us that 53% of the British population is non-religious, rising to 58% in Scotland. Only the over-65s show a majority as religious. Britain's national, established church, the Church of England, now has more pupils in its state schools, who are forced to pray every weekday, than it has worshipping in its churches every Sunday. Humanists UK discussed these "revelations" on Sky TV recently, on Sky News. There is hope for our nation that we will, at least in a generation or two, see the end of the established church and a stop to the privileged position of the 26 bishops in our upper legislative chamber. Although the CoE is fairly innocuous, it still controls 20% of our schools. There is little hope for established religion when those upon whom its future depends are rejecting it to the extent that the CoE, for example, is followed by only 3% of 18-24 year olds. I see a bright future for Britain, one in which the population is not deprived of the benefits of the expansion of knowledge , of science and of technology, simply because books from 2,000 years ago were written by people who did not know how the world works.